The people of ancient Egypt emerged as one of the first Western civilisations. Sustained by the River Nile and protected by vast deserts, the Egyptians lived in comparative security, prosperity and peace for thousands of years. When such conditions exist, the civilisation and its arts usually flourish. To this day, many of the Egyptian artistic creations display the wealth, splendour and talent of this great civilisation. Ancient Egypt has been called a land of temples and tombs. For centuries people have been filled with wonder at the ingenuity of the Egyptians, whose impressive works have withstood the ravages of time so well. Had it not been for the long-lasting nature of their monuments and carved inscriptions in the form of hieroglyphics', much evidence of their activities would have vanished from all historical records. In about 3000 BC, Upper and Lower Egypt were united under the first pharaoh, and generally from that time until the invasion by Alexander the Great in 332 BC, Egypt prospered as a nation of skilful craftsmen and artists. The Egyptians were an industrious, highly civilised and deeply religious people, who obediently accepted the supreme authority of their pharaohs. The people were content to serve and work for the state in return for a secure livelihood. They considered this earthly life to be a segment in a great cycle, at the end of which everything would be returned to its original form. The richer and more important the person, the more careful and elaborate would be his or her burial, and the stronger and safer the tomb in which they would be buried. There are about 80 ancient pyramids in Egypt. The Great Pyramid at Giza, which King Cheops built as his tomb 5000 years ago, holds most interest. 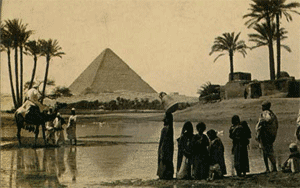 It stands with two other pyramids on a slight rise overlooking the River Nile. At the centre of the pyramid is the King's Chamber and leading down from there is a long narrow area known as the Grand Gallery. The pyramid covers 13 acres and contains 2,300,000 blocks of limestone, each weighing an average of 1.5 tons. Its pyramidal form has a perfectly square base with sides of 756 feet and a height of 481 feet. Situated directly below the King's Chamber is the Queen's Chamber and there are two air channels leading upwards from the centre of the pyramid to the outside. Near these pyramids stands the Great Sphinx, the origin and purpose of which constitutes one of the world's most famous puzzles. Shaped from an outcrop of stone in the form of a humanheaded lion, the face is possibly a portrait of King Khafra, the son of Cheops, who was buried in the second largest pyramid. The Sphinx is one of the biggest statues ever made. The Egyptian people showed reverence towards natural objects such as the lotus flower, the scarab beetle, the falcon, the lion, the sun and the River Nile. All these subjects and many more were used symbolically and conventionally as motifs in low-relief carving and painting. It was the custom of the Egyptians to depict the various parts of the human figure, usually in the most characteristic positions. The head was shown in profile except for the eye, which was represented from the front, the shoulders and a portion of the arms were portrayed from the front, while the hips and legs were side views. Wall decoration showed little or no attempt to indicate depth or perspective, except by placing distant objects above near things. It was essentially two-dimensional, and relative size indicated the status of the person, so the pharaoh was the largest figure in the composition.